A Russian hacking group used spearphishing to steal the Gmail login credentials of Hillary Clinton campaign staff, and that may be how campaign emails now being released were stolen, according to Secure Works. The attack targeted 108 hillaryclinton.com email addresses, and was carried out by a Russian group called Threat Group-4127 (TG-4127), according to Secure Works’ Counter Threat Unit (CTU) blog. CTU found that in addition to the Gmail accounts, TG-4127 also targeted the private email accounts of 26 people associated with either Clinton’s campaign or the DNC. In March the Secure Works researchers identified a spearphishing campaign that used Bitly to shorten the URLs for malicious sites. The attackers would send an email containing the shortened links in hopes the targets would click on them. Users rarely check the full URL associated with short links, so threat groups can use URL-shortening services to effectively hide malicious URLs. Clicking on the links led to a TG-4127 site that spoofed the Google domain login page. The spoofed page appears prepopulated with the victims’ Gmail addresses so it looks legitimate. If the victims log in, the site captures their credentials and the attackers can then use that information to log in to access the victims’ Gmail persistently, the blog says. DNS records for the hillaryclinton.com domain – used by Clinton’s campaign - show it used a Google Apps mail server. 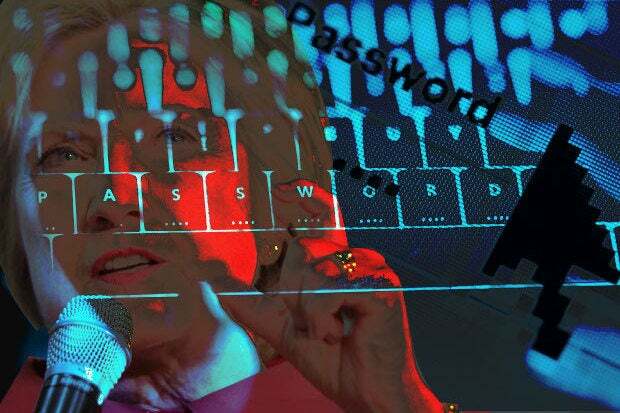 “When presented with TG-4127's spoofed login page, victims might be convinced it was the legitimate login page for their hillaryclinton.com email account,” the blog says. The attackers targeted 108 hillaryclinton.com email addresses in the phishing attack, and using open source research the CTU team identified 66 of the users of those accounts. Job titles for the targeted staffers included national political director, finance director, director of strategic communications, director of scheduling, director of travel, traveling press secretary and travel coordinator. “There was no open-source footprint for the remaining 42 addresses, suggesting that TG-4127 acquired them from another source, possibly other intelligence activity,” the blog says. The Bitly links - 213 in all - were first created in mid-March and the last one in mid-May. So far just 20 of them have been clicked, likely by victims responding to the spearphishing. “Eleven of the links were clicked once, four were clicked twice, two were clicked three times, and two were clicked four times,” the blog says. The researchers say that TG-4127 also created Bitly links to malicious Web sites and targeted nine dnc.org email accounts with them, including the DNC’s communications director and its secretary emeritus. The timeframe for this attack was mid-March to mid-April. The damage done by this type of hack could include the ability to access other Google services such as Google Drive and to generate spearphishing emails using legitimate email addresses internal to the organizations and possibly unleash malware in the organizations’ networks, the researchers say. The researchers say TG-4127 has targeted the White House, the German parliament and the German Christian Democratic Union political party. “CTU researchers assess with moderate confidence that the group is operating from the Russian Federation and is gathering intelligence on behalf of the Russian government,” the blog post says. The researchers have not seen this type of TG-4127 spearphishing attack target the Republican Party or other presidential candidates, but they didn’t use Google mail servers.